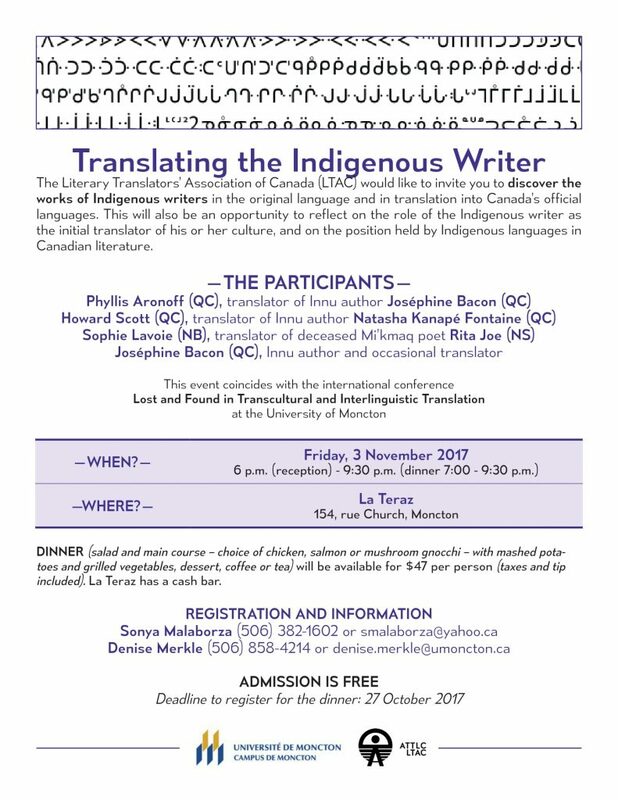 The Literary Translators’ Association of Canada (LTAC) is happy to invite you to a Traduire l’écrivain autochtone event as part of the University of Moncton’s La traduction transculturelle et interlinguistique : s’y perdre et s’y retrouver international symposium at 6PM Friday November 3, 2017, at La Teraz, 154 Church Street, Moncton. Featured participants include Phyllis Aronoff, Howard Scott, Sophie Lavoie and Joséphine Bacon. A meal (7PM to 9:30PM) is available for $47 (including taxes and tip). Please reserve your place before Friday October 27, 2017.